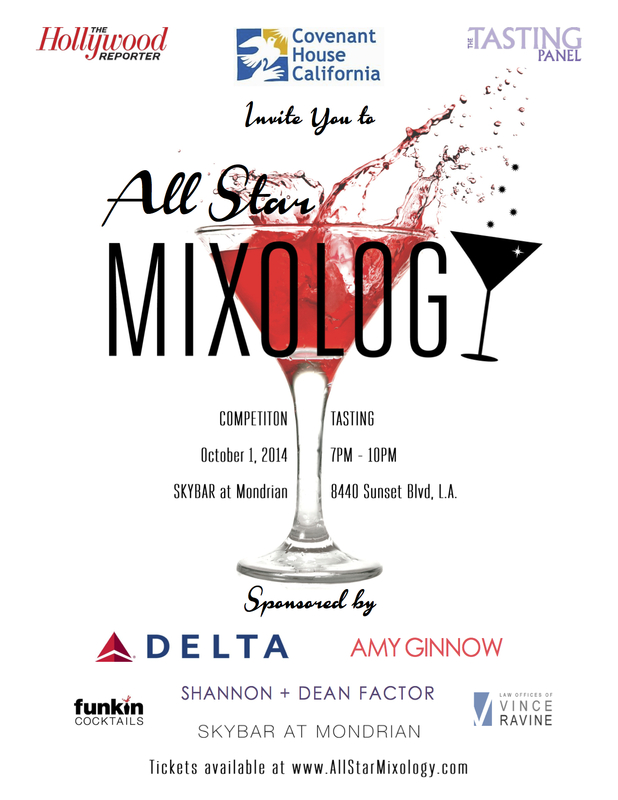 West Hollywood, CA— September 3, 2014—Join Southern California’s elite mixologists as they mix it up for a panel of celebrity judges to compete in the second annual All Star Mixology Competition to benefit Covenant House California on October 1st, 2014. At this year’s event, 10 top mixologists will display their creativity, technical skills and talent for a team of A-list judges including Jeremy Sisto (Suburgatory, Law & Order), Paul Hanneman (Co-President of Global Distribution, 20th Century Fox), Rachel Burkons (VP, The Tasting Panel Magazine), Alex Carlton (Owner, Funkin Cocktails), and Naomi Schimek (President, USBG Southern California). In partnership with The Hollywood Reporter and The Tasting Panel Magazine, the All Star Mixology Competition will play host to 250 of LA’s influential business, entertainment and philanthropic leaders. Guests will enjoy innovative small plates made with the freshest ingredients from the ocean, ranch, and garden from Herringbone at Mondrian and sip craft cocktails from various brands and portfolios includingCorbin Vodka, Palm Bay, 209 Gin, Frederick Wildman and Western Spirits. The event will be held October 1st, 2014 from 7pm to 10pm at SKYBAR at Mondrian, 8440 Sunset Boulevard West Hollywood, CA 90069. General admission tickets are $75 and are available for pre-sale at www.allstarmixology.com <http://www.allstarmixology.com/> . Proceeds from the All Star Mixology Competition will fund Covenant House California’s life-changing work with homeless, at risk and trafficked youth. Sponsors include: Delta Air Lines, Amy Ginnow, The Skybar-Mondrian, Funkin Cocktails, Shannon and Dean Factor and the Law Offices of Vince Ravine. Covenant House California (CHC) is a non-profit agency whose mission is to reach out to at-risk homeless youth living on the streets and offer them hope and opportunities to turn their lives around. CHC helps abused or neglected youth who have nowhere else to go. Many homeless kids have been thrown out of their homes while others have aged out or left the foster care system with no family, no support, and no one to turn to. Since 1988, CHC has positively impacted the lives of more than 160,000 homeless youth in Los Angeles and the Bay Area. More than 80% of CHC’s funding comes from private donations. To make adonation call 323.461.3131, ext. 253 <tel:323.461.3131%2C%20ext.%20253> . For more information visit www.covenanthousecalifornia.org <http://covenanthousecalifornia.org/> .